Do you remember the days when you'd sit down and wait for your favourite futuristic family to come on television? The Jetsons clan was always decked out in the coolest devices that did whatever they wanted at the flick of a switch or tap of a button. As they whizzed around in their flying car, you probably hoped that all this could be your reality as well. While we have yet to develop the whimsy that is the flying car, we do have some seriously cool smart home technologies that are changing the way we look at comfort. Check out some of these home design enhancements that are easy to install, and will undoubtedly step your home up to the next level. Get the lights just right for every occasion when you install intelligent lighting. Tom's Guide explains that there are several versions of lights that can be controlled right from an app on your smartphone so you can use them even when you're away. When designing your own home, be sure to request these - they're like a much cooler version of clap-on-and-off lights! Make your home smart with just the click of a button and a chat with G.J. Gardner Homes. Get the temperature just right every time with a smart thermostat. These have wireless sensors in each room so you can program them to whatever temperature you are most comfortable with. If the temperature starts to vary, the technology kicks in to readjust the room. And of course, there is an app to accompany these thermostats. Next up, let's talk security. As you consider your home design, you must think about protecting the most valuable asset of all - your family. There are quite a few different smart lock technologies, including some that have keypads. Guessing your numeric password is much harder for a burglar than picking your lock! 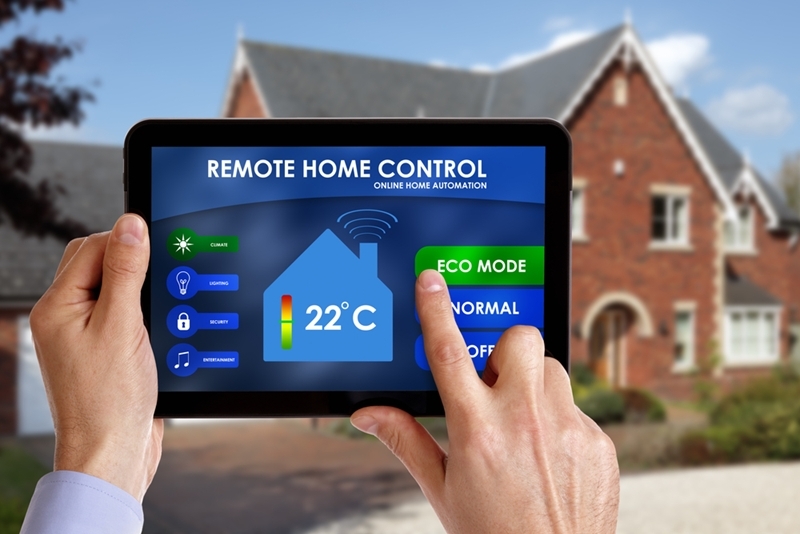 There are a plethora of safety technologies that have specific functions for your home. There are outdoor security cameras that will alert you to any unusual activity, and there are indoor cameras so you can keep an eye on things in the home as well. Even if that's just to watch what your dog is up to while you're at work. Ready to implement these smart home gadgets in a seamless manner? Give G.J. Gardner Homes a call to chat about a home design plan that will make you feel like you've stepped into the future.